A free box, an embarrassing parent and over 100 #free #scifi_books! This week I have mostly been cheating and taken my blog post from my monthly round robin email, but when you get to the bit about books you’ll understand why because it’s good. 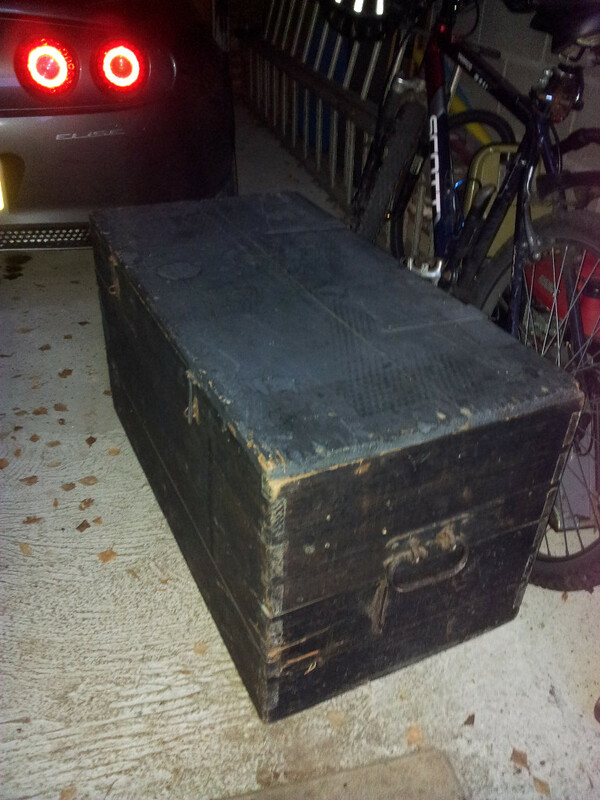 This week as McMini and I trundled home from school we noticed a large wooden box in someone’s front garden. It was big, big enough to accommodate a full grown adult well … a small one anyway, and it had a sign on it saying, ‘free please help yourself’. Shameless skip‐shopper that I am, there was no way I was going to leave it there, but sensitive to my McMini’s sensibilities I asked him anyway. After a brief discussion as to whether the box was the free item in question, or whether there’d originally been something else on top, which some other enterprising local had already removed, we decided we’d take the box, paint it and use it to store some of McMini’s gargantuan collection of lego. Even though we were 99% certain it was the box they were giving away we decided to make our exit a sharp one. The box and its garden were only a few hundred yards from our house so it wouldn’t take long to nip home. Except that when it came to moving the box my arms were not long enough to carry it by both handles so the exit was not exactly sharp. It involved puffing, panting, pigeon steps and lengthy stops for protracted bouts of breathless wheezing and giggling. After ‘carrying’ it about five yards in 10 minutes, some kind local took pity on us and took the other handle. We got it the rest of the way in about 30 seconds flat! Continuing on the subject of getting something for nothing, I wanted to give you the heads up about some free sci‐fi and fantasy books that will be up for grabs this weekend: over 100 of them! Renowned Australian sci‐fi author, Patti Jansen has got together with a bunch of over 100 other sci‐fi and fantasy authors who, in a moment of March madness, will be giving away their books for free. The theme has two streams: books that are in Kindle Unlimited — although I believe many of those are going to be free to non Kindle Unlimited Amazon users for 5th and 6th March — and free first in series on Kobo; they’re free whatever. Patti has kindly included a link to download the Kobo app, for any amazon only users who might want it. More details can be found on the giveaway page, which is on Patti’s site. I got a free box, and you can get some free books. Blogging Off Piste and Visiting the Real World. Here’s to embracing my inner tortoise. Hello Mr Hare, would you like to try some Mogadon?